ELEY are celebrating 190 years of manufacturing excellence this year, and to mark the occasion ELEY are running a knock-out style 50m .22LR Rifle Prone, e-limination match to be launched 1st October 2018. The competition will be limited to the first 32 entrants. This unique competition is £8.00 to enter and all entrants receive a new style ELEY towel as an entry gift. Competitors will be drawn randomly against each other in the first round, and work their way through the bracketed competition to reach the final. ELEY’s competition is unique as competitors compete from the comfort of their own club! The myELEY platform launched earlier this year enables competitors to upload competition scores, including photographs of targets to be verified by competition staff online. 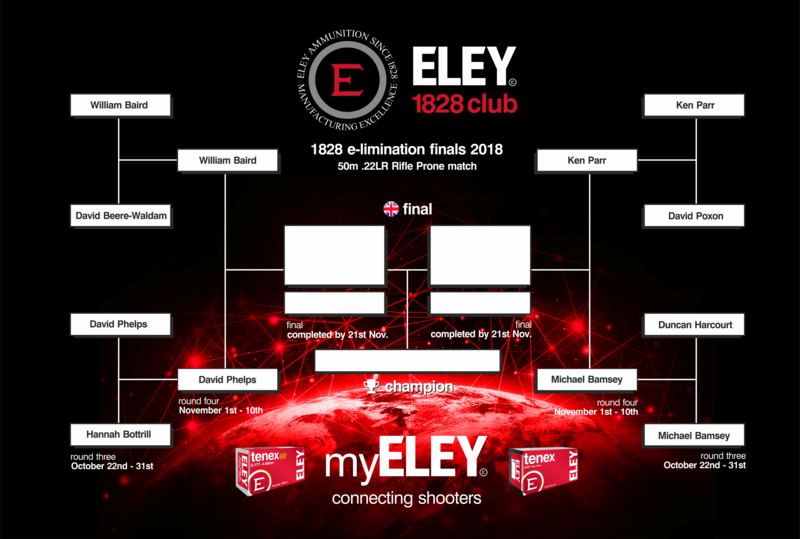 The winner of the ‘ELEY 1828 club e-limination match’ will receive ELEY clothing, a goodie bag and a visit for themselves and a friend to the customer range at ELEY’s state of the art test facility in Birmingham. When you have shot your target, click on the target code in your dashboard and upload your score and a picture of either the electronic target screen, results print out or individual paper targets. This competition will be a bracketed competition where you will be paired randomly against another competitor in the first round. The winner of the first round will move on to the next round, if you continue to win, you will continue to advance to the next round. All matches can be shot at your local range and scores uploaded via your myELEY personal dashboard. – See the how to guide here. The first round of head to head competition will begin October 1st, 2018. You will have 10 days to shoot one 60 shot 50m Prone match. Your scores (Integer) can be shot either on electronic targets and the score recorded as one complete entry ie. a maximum of 600 points and 60x (x1) or entry on the more traditional paper targets, where 6 individual scores would be entered, with a maximum of 100 10x per target (x6) pictures of targets must be uploaded to the myELEY.com platform no later than October 10th, 2018 at midnight UK. The second round of head to head competition will begin October 11th, 2018. You will have 10 days to shoot one 60 shot 50m Prone match. Your scores (Integer) can be shot either on electronic targets and the score recorded as one complete entry ie. a maximum of 600 points and 60x (x1) or entry on the more traditional paper targets, where 6 individual scores would be entered, with a maximum of 100 10x per target (x6) pictures of targets must be uploaded to the myELEY.com platform no later than October 21st, 2018 at midnight UK. The third round of head to head competition will begin October 22nd, 2018. You will have 10 days to shoot one 60 shot 50m Prone match. Your scores (Integer) can be shot either on electronic targets and the score recorded as one complete entry ie. a maximum of 600 points and 60x (x1) or entry on the more traditional paper targets, where 6 individual scores would be entered, with a maximum of 100 10x per target (x6) pictures of targets must be uploaded to the myELEY.com platform no later than October 31st, 2018 at midnight UK. The fourth round of head to head competition will begin November 1st, 2018. You will have 10 days to shoot one 60 shot 50m Prone match. Your scores (Integer) can be shot either on electronic targets and the score recorded as one complete entry ie. a maximum of 600 points and 60x (x1) or entry on the more traditional paper targets, where 6 individual scores would be entered, with a maximum of 100 10x per target (x6) pictures of targets must be uploaded to the myELEY.com platform no later than November 10th, 2018 at midnight UK. The final round of head to head competition will take place between November 11th, 2018 and November 21st, 2018. The final two competitors will have the opportunity to compete at the same time if a time and date can be agreed upon. If there is not a time that can be agreed upon the final two competitors must shoot one 60 shot 50m Prone match and upload scores (Integer) can be shot either on electronic targets and the score recorded as one complete entry ie. a maximum of 600 points and 60x (x1) or entry on the more traditional paper targets, where 6 individual scores would be entered, with a maximum of 100 10x per target (x6) targets to the myELEY.com platform no later than November 21st, 2018 at midnight UK. ISSF 50m Prone rules are in effect for this competition. Each round must be shot in the time period allowed by ISSF rules (15 mins sighting) (60 mins match). The match can be shot on either paper targets or electronic targets, pictures of the scored targets (Integer) or a picture of the electronic screen with the final (Integer) score must be uploaded to the myELEY.com platform for all competitions.